C.1895, Ansonia "No. 501" Porcelain China shelf clock in very good condition. This is definitely a German Bonn case, but it slipped through unsigned; retains original Ansonia movement. There is a small brass shim behind the brass bezel that should be removed, but it has been there a long time, so we left it. Good open escape movement runs and strikes and with fancy dial with red fleur-de-lis between the Arabic numerals. 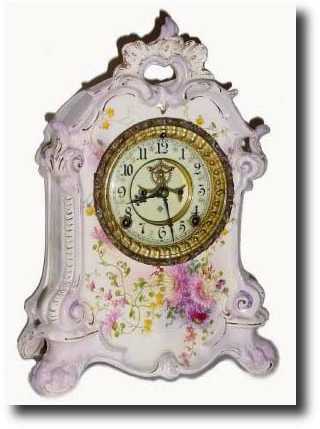 This case has the identical floral trim as the clock pictured in Ly\'s Ansonia book (1998), page 628; light purple case with yellow and dark pink flowers. Note the sides and top of the case are fully decorated with similar flowers. Ly gives this model a value of $1000, but without the signature, we are assigning a lower estimate; Height 13"